DENALI PARK, Alaska: Following a lightning storm that threw over 31,000 lightning strikes from June 19 – June 21, five wildfires are now burning in remote locations in Denali National Park and Preserve. None of the wildfires are threatening park structures or sensitive resources. Due to the remote locations, fire managers have opted to monitor these fires. 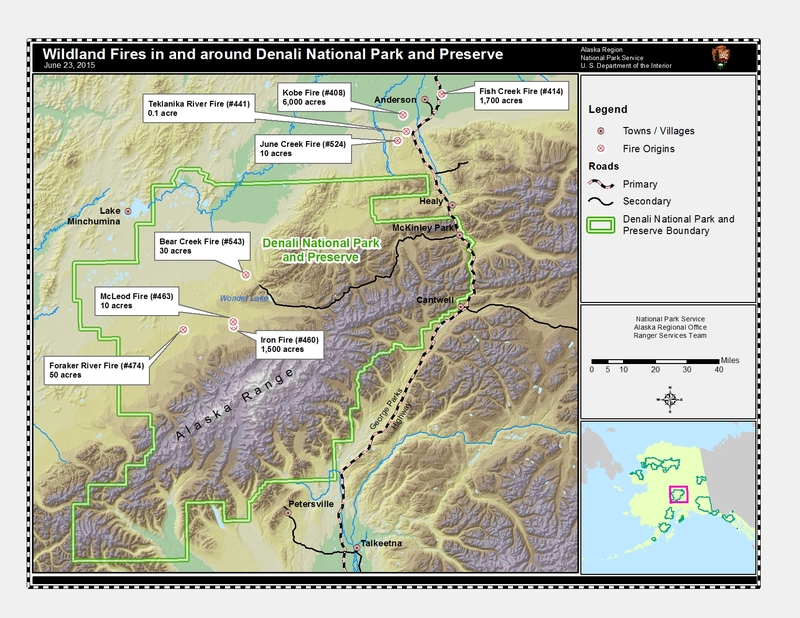 The largest and most active wildfire in Denali National Park is the 1,500 acre Iron Wildfire. Spotted from a Kantishna Air Taxi pilot on the evening of June 20. Under the very hot and dry conditions, extreme fire behavior was observed with aggressive crown runs. Smoke may be visible from Turtle Hills. The Foraker River was burning approximately 28 miles southwest of Wonder Lake. It was approximately 50 acres, actively running and torching in black spruce. At approximately 10 acres, burning in black spruce, the McLeod Wildfire was actively growing around 80 percent of its perimeter. A fourth fire was spotted near the upper reaches of the Highpower Creek. Further information will be provided when available. On June 22, a fifth fire was reported five miles Northwest of Kantishna. The Bear Creek Wildfire, estimated at 30 acres, is burning in black spruce. Active fire behavior was observed. Due to the recent dry lightning event in the region and accidental human-caused fires statewide, park officials have determined it is necessary to prohibit the use of all open fires and activities. The term “open fires” refers to any flame source not immediately extinguishable or controllable and applies to any form of wood or charcoal-based fire, even in established fire rings. Use of gas grills, backpacking or camp stoves using fuel or compressed canisters which can be regulated and shut off are still permitted. Fire restrictions within the park generally correspond to fire restrictions put in place by the State of Alaska; however, they are managed independently by the National Park Service. Decisions to lift or continue restrictions will be made by park staff and based on the wide geographic range and diversity of available fuels within the park boundaries.